In a time of such strangeness in the way that classical music recordings are packaged and marketed, Decca's Original Masters series and its brethren actually make sense. Fifty-year-old recordings generally appeal not to thirtysomethings (who must be asking themselves how one recording or another fits into their "lifestyle"), but to those who were collecting LPs back in the 1950s, or to those (like myself) who believe that to listen is to remember, and to respect. Collectors in these latter two groups are likely to have several – if not more – recordings of the basic repertoire, so it makes little sense to reissue Kleiber's and Schuricht's recordings in dribs and drabs. Instead, let's have them in big, economically-priced chunks, because this time around our interest is in the conductor first, and in the repertoire second. Check the lists of businesses who sell used records and you'll see how highly prized Kleiber's and Schuricht's LPs are. 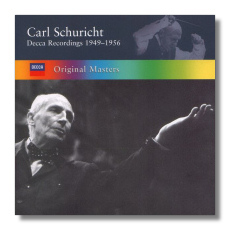 Schuricht's set includes his Decca recordings from between 1949 and 1956. This is the first international release for all of them, save the Brahms Piano Concerto #2 (with Backhaus, from 1952) and Schubert's "Unfinished" (from 1956). Beethoven's Fifth Symphony, the Schumann selections, and the Tchaikovsky were recorded with the Paris Conservatoire Orchestra; all the rest were with the Vienna Philharmonic. Schuricht conducted a wide range of music, and what he recorded during his career does not represent the breadth of his talent, although it adequately preserves its depth. He was an objective conductor, not prone to exaggeration. In fact, the recording of Brahms' Second Piano Concerto is, if anything, understated, though not dull. This interpretation serves as a corrective to muscular, showboating readings in which virtuosity comes first. The same can be said of the Brahms Violin Concerto with the always intelligent and refined Christian Ferras. The Vienna Philharmonic is fallible on some of these recordings (Brahms' Symphony #2, for example), but the quest for technical perfection was not as obsessive as it is today. (In the early 1950s, a missed note was not the end of the world.) The reedier sounding Paris Conservatoire Orchestra brings unusual but attractive timbres to the Schumann and Tchaikovsky recordings. Everything has been transferred to CD very well, and collectors with an interest in this conductor should have few qualms about retiring their LPs (or putting them in the attic, at least) after hearing this set. Erich Kleiber was born in 1890 in Vienna, and his development as a musician took place both in that same city and in Prague. His early career was distinguished, and he received major recognition early. In 1923, he was named music director of the Berlin State Opera, and he held that post for a little more than a decade, until the political situation in Berlin became untenable, and he spent the duration of the World War Two in Argentina – a fact that probably explains why his son – a remarkable conductor in his own right – is named Carlos! Returning to Europe after the war, he was unable to recapture the stability he enjoyed in Berlin, although he remained in demand in London, Amsterdam, Vienna, and with various German broadcasting orchestras – including Cologne's. (The last is represented on this set by performances of the Weber, the Schubert, and the German Dances and Symphony #39 of Mozart.) He enjoyed an exclusive record contract with Decca, and he died in 1956, unable to complete many of the projects that he and Decca had planned together. What was completed is wonderful, including items not included here, such as complete recordings of The Marriage of Figaro and Der Rosenkavalier. These recordings cover the period 1949-1955, and many are receiving their first international release here. His Beethoven symphonies have always been a standard of the early LP era, and his very Viennese "Choral" Symphony is memorable in spite of its objectivity. This set gives us an opportunity to compare both the "Pastoral" and the "Eroica" in two different versions. Kleiber recorded the former in 1948 with the London Philharmonic Orchestra, and then again in 1953 with the Concertgebouw Orchestra in Amsterdam. Similarly, the "Eroica" was recorded in 1950 (with the Concertgebouw) and 1953 (with the Vienna Philharmonic). 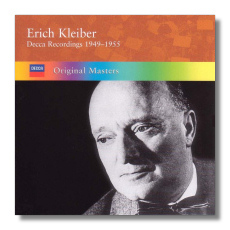 This might seem surprising, but Decca was making large leaps in its recording techniques during this period, and the company must have been anxious to preserve Kleiber's work in the best sound possible. Kleiber was a perfectionist, and he probably welcomed the opportunity to remake recordings. Furthermore, he – like Sergiu Celibidache – considered recordings to be a falsification of music-making, a freezing of moments in time that were intended to be fluid and evanescent. Might it have been true that, by recording the same work twice in a fairly short period of time, Kleiber was demonstrating how fatuous it was to learn a piece of music solely from a single recording? Certainly these "Pastorals" and "Eroicas" are different enough from each other to justify such a viewpoint. Both sets give more then their money's worth, and Decca has managed to pack five and six discs, respectively, in a standard double-width jewel box, so your shelf space has been considered too!